Trail cameras have a multitude of applications which range from hunting to even using as security cameras in gardens and backyards. Choosing a budget trail camera is confusing given the fact that so many makes and models are available, and finding a decent budget friendly trail camera which offers great value for money is not easy. Simmons has been in the market for a long time and has developed its Whitetail Trail Camera with a great deal of passion, and this reflects in every aspect of the device. 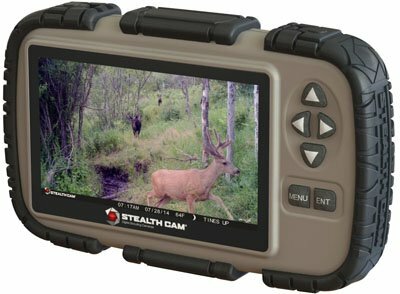 Packed with brilliant features, the Simmons Whitetail Trail Camera with Night Vision has received many positive reviews. 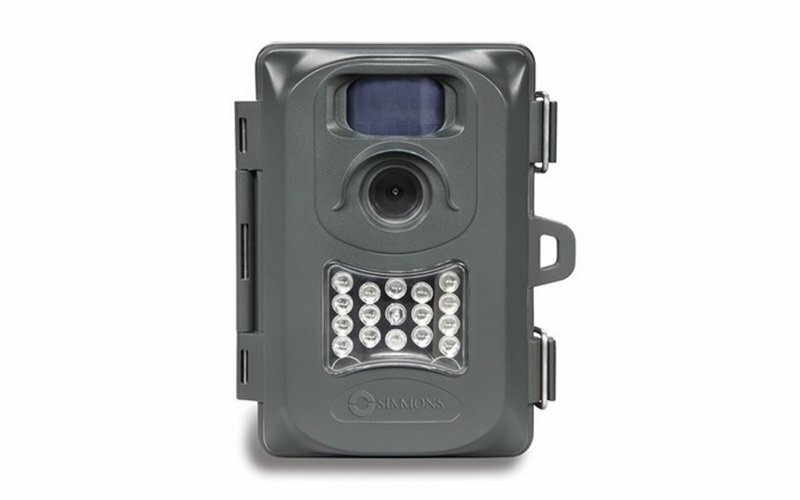 The Simmons Whitetail Trail Camera is a very low profile device which can be hidden anywhere out of sight, for example on trees or bushes and such. It comes enclosed in a stock case, but you can also customize any type of case according to your needs. While taking photos in the dark, this camera also makes sure not to spook the subjects. The device is compact and measures at 2.9 inches x 9.8 inches x 7.4 inches and weighs around 6.4 ounces. This means that it does not add much weight or take up much space in your accessory kit. The camera build is robust, and some user modifications to the outer casing can further enhance its sturdiness. Having a long range motion sensor is very important for trail hunting since most hunters need to cover as much field of view as possible to add to the accuracy of the game’s trail. This trail camera has PIR motion sensors which have a range of over 30 feet. Also the fast reaction and shutter accuracy ensures that you do not miss anything. Even in complete darkness, the motion sensor is as active as it is during the day. This huge range also makes it perfect to be applied to any kind of security applications like using it as a security camera at night. Another important feature is the night vision system. This device is equipped with an 18 IR LED flash. IR LED flash is just like a normal flash except it is almost invisible to any game. This has an effective range of 40 feet. Night time black and white images captured by this camera are sharp and of very good quality. They give you a detailed snapshot of positions and movements around the camera’s view. While taking pictures, the IR LED flash does light up, but the light is so faint it is almost unnoticeable. Video and images recorded by the Simmons Trail Camera are of very good quality and each detail can be seen with precision. This device can take images with 5 or 6 MP resolutions and videos are recorded at 640×480 resolution, but they are of amazingly great detail. While daytime images and videos captured are in color, night images and videos are black and white (greenish tinge) but offer the same resolution as daytime images. The image and video quality alone puts this device in its own league. The device is powered by 4 AA sized batteries and battery life is calculated at as long as 6 months. So, this camera can be used for seasonal hunting and trailing of game and has been proven over and over again from its thousands of users. Its long battery life is complemented by an additional 32 GB SD card which can provide a huge amount of space for videos and images. If you are using it for night time videography purposes, you can use a number of SD cards and swap them out regularly. Rugged, lightweight and slim design; easily fits in your accessory kit. Accurate PIR motion sensors with a range of 30 feet. IR LED flash for nighttime imagery. 6MP resolution camera offers great details in your images and videos, even at night. Powered by 4 AA sized batteries with a long battery life of 6 months. Supports a 32 GB SD card and hence it has enough space for recording. Stock casing is not weatherproof. Q) What happens if the SD card gets full? A) If the SD card gets full, it will not record any more images. It does not delete or overwrite old images. Q) Does this camera flash at night? A) Technically yes, this camera does flash at night. But the light emitted by the IR flash is almost of negligible intensity; it and cannot be spotted by game most of the time and will not spook animals. Q) Can this camera be mounted inside a box? A) Absolutely. If you want you can customize a box by yourself to mount this camera for added protection. This camera already comes with a stock box which can be opened to change the memory card. The Simmons Whitetail Camera is all about great photos, ease of use, sturdy build, and it comes with night vision abilities and a lot of features which are packed into this device. It’s no wonder that many Simmons Trail Camera reviews have been so positive everywhere. Being top quality does not always mean having a high price, this is a budget friendly accessory which is a must-have for professionals and beginners alike. The time-stamped high quality pictures and videos captured by this low profile device are perfect not only for game hunting but also for education, research or entertainment purposes. No matter what you use this camera for, this is a device you should consider. For a few other best hunting camera reviews, read our Best Hunting Camera Reviews and Buying Guide.